Who comes off the 40-man? 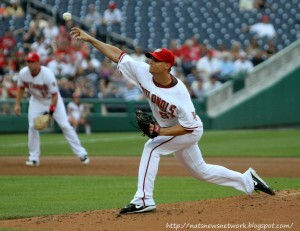 1/19/11 Update: with the signing of reliever Todd Coffey, the team now appears to be three men over the limit. Oh, and about 2 hours later the signing of infielder Jerry Hairston now requiring four guys to be dropped or traded. One player has been cleared off the 40-man; the predicted JD Martin given his outright release unfortunately later in the afternoon. Unless I’ve forgotten how to count, and unless I really do not understand the 40-man roster rules, the Nationals have been over the limit for nearly two weeks now. They signed Adam LaRoche on 1/4/11, then made the announcement official on 1/7/11. Answer: per Zuckerman’s posting today, “corresponding [40-man roster] moves don’t have to be made until the contract for the new player is formally processed at MLB headquarters in New York.” LaRoche’s contract didn’t hit NY til today, so the Martin release is the corresponding move. Still 3 to go. Yet, here we are on 1/19/11 and no corresponding move has occurred yet. The Nationals’ 40-man roster has been above 40 ever since. I believe teams have to make immediate moves but do not have to make them public; a player could have been designated for assignment on 1/7/11, at which point the team has 10 days to actually decide what to do with him. So perhaps tomorrow 1/19/11 (since we had a holiday mixed in there?) we’ll have an answer. Likewise, Tom Gorzelanny will also require a corresponding move, since none of the 3 players traded for him were on the 40-man to start with. With his addition (yes the trade has been announced but it will not be official until all physicals are passed) we’ll be at 42 (43 with the Coffey signing). 1. Justin Maxwell: I know that Maxwell is a local and is a fan favorite, but the fact remains that we now have at least 5 outfielders with major league time last year (Werth, Ankiel, Morgan, Bernadina, and Morse) that seem to be ahead of Maxwell on the depth chart, plus a 6th outfielder prospect who will get a look prior to Maxwell at this point (CBrown). He’s never produced at the MLB level and is now far too old to be considered a prospect. 2. J.D. Martin: Martin is probably the right-handed starter version of Maxwell. He’s fallen down the depth chart, his name isn’t being mentioned as even competing for a rotation spot out of spring, and the argument can be made that he’s not in the top 5 players to make the AAA rotation. He’s always had ok numbers when he’s pitched in the majors but in a power-arm league, spots for soft-tossing slight-of-frame right handers are limited. 3. The third and fourth spots are tougher. I think #3 may end up being someone like Luis Atilano. Mediocre MLB numbers in 2010, coming off of injury, he probably can sneak through waivers as Chico did and get assigned to AAA to try to get back. He’ll be 26, slightly older than you want in a prospect, and he’s clearly not in the MLB rotation battle for 2011. 4. Atahualpa Severino: he has no mlb experience and is behind Slaten in the loogy battle right now. However, other teams may see that we just added him to the 40-man last year and might take a look. He’s a bit old for a prospect with no MLB time and he could slip through waivers. This 4th spot is a stretch though, and I think honestly a better way to clear space may be a set of prospects trade for a veteran. I don’t see at this point how Morse or Detwiler makes the 25-man roster, so perhaps we should look instead to package these guys for a player. Other candidates (and their reasons for keeping them over Atilano and Martin right now) could be Mock (lively fastball, good stuff and a favorite of the organization), Martis (still young and still could prosper), and Marrero (still too early to give up on him; needs one more season to prove he belongs but he’s clearly blocked for 2 years by LaRoche; could be a trade candidate). Love the Trade to get Tom Gorzelanny. The three guys we gave up were all marginal prospects in the grand scheme of things. Burgess was a Bowden toolsy draft pick who has moved slowly through the farm system and now is completely blocked for the next 7 years or so by Werth and Harper. I really liked AJ Morris when we drafted him (he was a 4th rounder but was fantastic in college, giving Mike Leake his only loss of the 2009 season) but he’s already lost his starter status and seems like a middle relief guy at best. Lastly Graham Hicks was probably the 2nd or 3rd best pitcher in Hagerstown this year and has some promise. Gorzelanny’s numbers are not fantastic, but you wouldn’t expect them to be for a 5th starter from a team that lost 90 games last year. He had a 106 era+ for the season pitching out of a hitters park in Chicago. He probably has the inside track on the 5th starter spot here in DC by virtue of his acquisition. If the season started tomorrow you have to think the rotation would be going Livan, Lannan, Zimmermann, Marquis and Gorzelanny. Maya and Detwiler are starting in AAA save an injury, and Wang has a bit more time to rehab. Meanwhile, AAA is looking jammed. We already had Atilano, Martin, Mock and Martis as returning rotation starters in AAA. Chico is down there as well, having passed through waivers to be reassigned. Maya and Detwiler are going to need places to pitch. Plus we have some older prospects from last year’s AA team (Roark and Tatusko) who really need to be pitching in AAA to see if they’re MLB candidates. All in all, a competent pitcher to compete for a spot in the rotation and who may help out the rotation in the short term. And not for a lot of money (probably something close to Lannan’s $2.75M deal for 2011).